Having waved our guests off from Staniel airport on Friday afternoon we were invited to share some fresh Mahi Mahi (jolly nice fish) with John and Julie on Amazing Grace who had just sailed up from George Town. Having lost a 4 foot long Mahi on the way they promptly caught a slightly smaller one. Being the nice people they are they decided to offer us a fish supper. How could we refuse except that it was blowing ol' boots from the north-east which would guarantee a bouncy five mile trip round to Black Point where they were. That was not enough to deter us. With spray lashed decks we dropped anchor just yards from them late in the afternoon. We dinghied over in the strong winds in what was to be our farewell trip in our beloved 'dink' although we didn't suspect that fact until 2215 that evening when with bellies full of fish and wine we trooped out on deck to say our 'goodbyes' only to find our 'car' had vanished into the night. 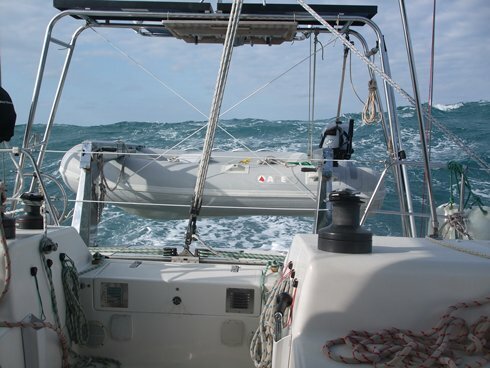 Without a second thought John lowered their own dinghy from its davits. With searchlight in hand the skippers briefly stopped off at Ajaya to collect a back-up light, mobile VHF and a couple of jackets. They motored off downwind in what we thought would be the general direction of drift in the strong winds. With it being a dark, grotty night people on surrounding boats had probably retired below early otherwise there would have been a good chance the runaway inflatable would have been apprehended as it wandered through the anchorage. We had no idea how long the dinghy had been gone although it was still securely tied to the midships cleat when we were enjoying the pre-meal sundowners in their cockpit earlier. Motoring downwind in 20-25 knots in a ten foot dinghy is ridiculously easy with a lot of distance being covered in a short space of time. They waved flashlights into the dark in the hope of seeing our RIB with its 4hp engine bobbing around waiting for rescue. Seeing nothing they were now probably a mile or so away from the security of the anchored boats - next stop Andros some 40 miles distant across the banks and the Tongue of the Ocean. It's one thing to loose a dinghy and engine into the night but should John's engine cough, splutter and die they could have been in real trouble. They turned around and headed back into the teeth of the strong wind which is when things became interesting and very wet. Motoring into strong wind-driven waves of around two feet in height which were hitting them head-on causing great slops of water to be shipped over the bow and subsequently over them. The shower-proof jackets did help a little but to avoid becoming saturated from the salty spray they would have needed drysuits. The skippers were very relieved to regain the relative security of the anchorage and having called up the 'Admiral' on the VHF she had already switched on the deck flood light to assist navigation although surprisingly it wasn't until a lot closer that anything could be made out from the dinghy. John dropped Phil off at Ajaya and we retired straight to bed sad to know that so much had just drifted away from us. It was such a waste. 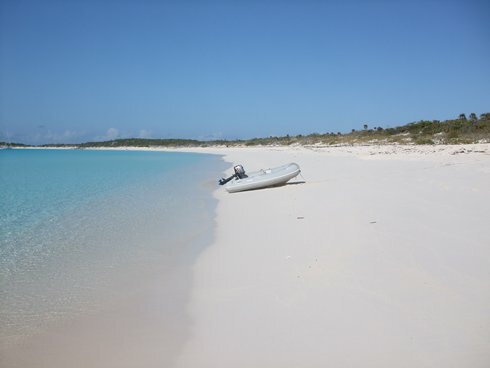 Apart from the kind offer of free lifts of which there were many we had absolutely no means of going ashore either at Black Point or most other places in the Exumas except to swim which wasn't exactly practical. We woke the next morning and for one or two seconds all was well with the world until reality took over again - we were minus our 'car'. A glimpse out of our saloon door revealed the empty davits to confirm that fact. We put out a call the next morning to see if anybody may have spotted our runaway craft. But, on a rough calculation at a drift rate of at least 2 knots it would have been at least 20 miles away and still going strong in the same general direction as the wind had not abated. On the Sunday John and Julie ran us ashore and we visited the local police station. It was shut but as we walked down the road along came the Black Point Police car looking as though it had been stolen by a teenager in cut off jeans and a snazzy sweatshirt - but no - he was the policeman, one of two that work shifts in the community. In an office that had probably changed little from the 50's we made a full statement (handwritten with no sign of a computer anywhere) and left Black Point for George Town the following morning in company with Amazing Grace. They were kindly chaperoning us whilst we sought replacement dinghy and engine in the largest live-aboard boating community probably anywhere in the Caribbean. The police report which Phil had signed off at Black Point had to be verified by the senior policeman and then faxed to the police in George Town. 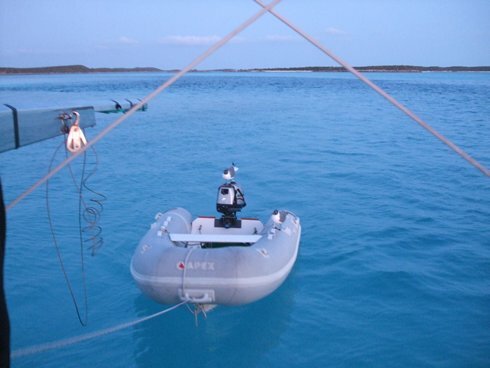 The VHF radio net in George Town was the perfect medium to advertise for the replacement dinghy. We had already been in contact with our friends on Polar Pacer who were already there. Tom is solid gold and enthusiastically started the hunt for another dinghy prior to our arrival and sourced a few possibilities for us to look at. 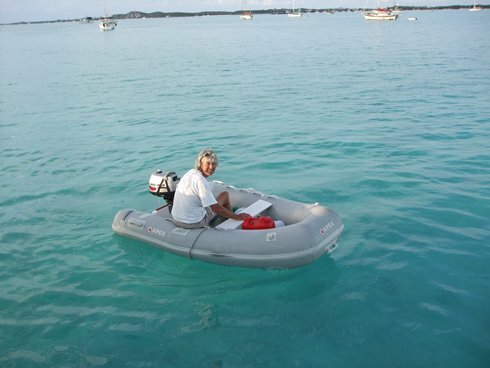 The alternative would be to import a new dinghy from Florida and with the Bahamas not having 'outlawed' 2 stroke outboards as yet we could at least obtain an engine locally. 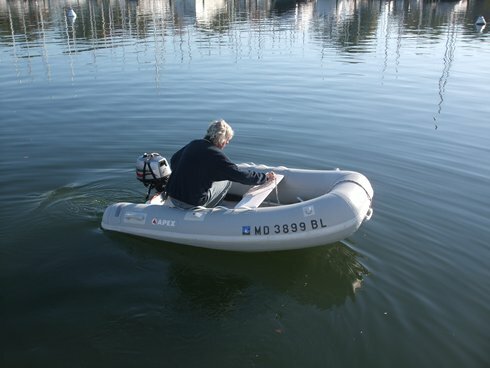 In the end this is what we did using (suggested by John) an Ocean Cruising Club port officer in Fort Lauderdale (who also works at West Marine) for the new dinghy, a 10'2" RIB, with a 15hp outboard from the local Yamaha dealer in George Town. Meanwhile, we visited the police station to see if our statement had arrived from Black Point. It hadn't. In fact five days later it still hadn't arrived so the local police perhaps out of embarrassment kindly provided one from the brief outline report submitted by Black Point. Unfortunately, collecting this at the close of play on Friday afternoon we were too late to catch Customs despite rushing to their door waving the manila envelope. 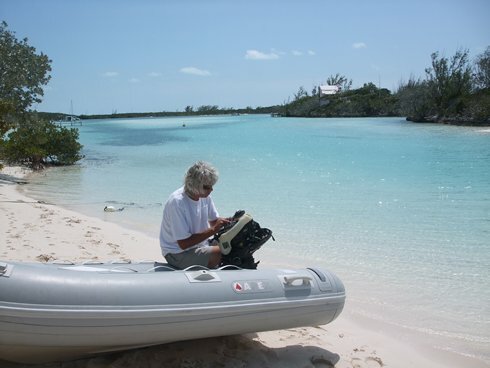 Later, on checking the contents we found our surname misspelled with no mention of our boat name at all which would not impress either Customs or our insurers. Monday found us again in the police station waiting for the sergeant to amend our report. The Police Chief called in and looked at the report before signing it off. In the local patois Phil could make out amid the general laughter amongst the rank and file bobbies the 'pop pop' noise with 'Seagull' and 'Nassau' mentioned which could be construed as a joke that some idiot from Black Point had stupidly stolen the dinghy to get to Nassau and would never ever arrive given the low power our small engine was capable of outputting or maybe that should be outputt...putt... putting! Phil sitting in reception smiled politely at the in-joke hoping to have the report in his hands without further delay. In the meantime we have borrowed a replacement dinghy and engine from separate sources. 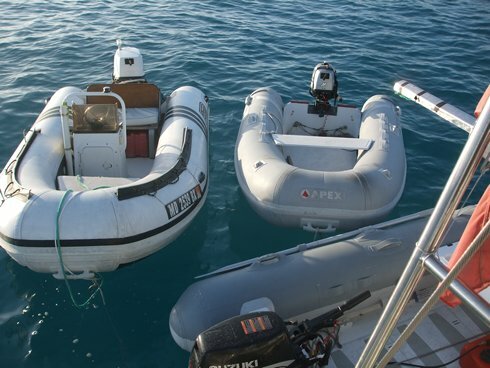 The dinghy, a small Achilles has a leak in the single skin floor and so settles at a level in the water commiserate with the weight it has onboard. So with two of us and the engine strapped on we tend not to wear our best shoes or clothes come to that. 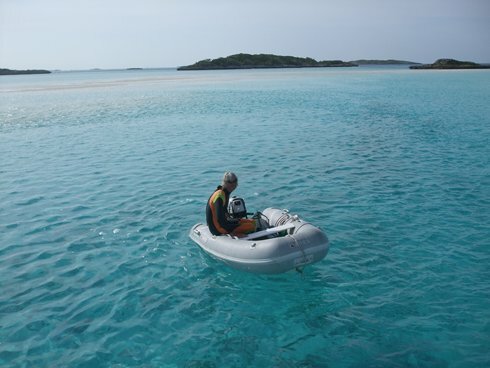 Without the engine we would have major difficulties as getting into George Town itself involves anchoring in an exposed area open to the full force of the prevailing wind with a mile of fetch to make life in any dinghy interesting. We are getting by and without these kind offerings we would have been severely hampered with our efforts to get ashore to sort things out. Roll on next week! But we do wonder where our beloved 'dink' is now. Just hope somebody deserving has found it and they don't have too much trouble from the engine - it was never quite the same after the gear shift lever had been replaced in Herrington and like all small engines it simply hated the Ethanol laced gasoline sold in the USA these days, although 'Skip' had managed to get the time taken to remove the idle jet, clean and re-assemble down to about 10 minutes!